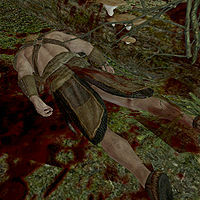 Niels, a Nord bandit, was part of a Falkreath-based hunting party led by Valdr. The group recently disappeared when they chased a bear sow into Moss Mother Cavern. You will find out what happened during the related quest. You will find Niels halfway through the cave where he was ripped to shreds by spriggans, although the bear may have participated as well. Niels wore randomly determined light armor; at all levels, there is a 50% chance it will be fur shoes and a set of fur armor, while the other 50% can differ; at level 1-5 it can be hide boots and/or hide armor or studded armor, at level 6-18 it can be leather boots and/or leather armor, and at level 19-28 it can be scaled boots and/or scaled armor or scaled horn armor. Additionally, there is a 50% chance of him wearing a set of leveled gauntlets, again randomly determined; it can always be fur bracers but, at level 1-5 there is a 50% chance it can be hide bracers, at level 6-18 it can be leather bracers, and at level 19 it can be scaled bracers. Lastly, there is a 20% chance of him carrying a leveled shield, up to elven quality at level 12. His weapon of choice is random and leveled as well (up to elven quality at level 22) and can be either a mace, a sword, or a war axe. He also carried a bit of random loot, food and drink, with a slim chance of a lockpick and/or some gold. The only survivor of the group is Valdr, who will be sitting outside the cave, heavily wounded. He will tell you about the fate of the hunters: "We tracked a bear to this den. Good coin for those pelts. We had the big sow cornered when they showed up. Three of them, out of nowhere. Spriggans. Niels went down before we even knew to run. Ari died just inside." Once you have healed him, he will ask you to help him avenge the deaths of his fallen comrades: "But now what? I can't just walk away. Not with my friends' bodies in there, being torn apart by those beasts." Once the cave is clear, he will do one last thing for Niels and Ari: "I'll give them a proper burial, then head back." Niels' body will then disappear from the game. This page was last modified on 27 January 2016, at 03:39.